I’ve been wrestling with myself about whether or not I’d write something about Steve Jobs… everyone else is doing it, people must be getting tired of it by now… but I really, really…. really wanted to say this. I am not a “fanboi”, as they’re called… meaning I’ve never stood in line to buy an Apple product, I have only ever had a couple of Apple products in my life. But that doesn’t mean that I can’t see the impact that Apple, and of course, Steve Jobs, has had on just about every aspect of our current lives. Especially being in the Autism community where the Apple ipad inadvertently opened up the world of Autism to a whole new way of thinking. But this is not a post about Steve Jobs or his products. If you’ve never read the Hitchhiker’s Guide to the Galaxy, I have to explain this to you because it’s a bit of a very interesting coincidence. In the book, some super beings ask a supercomputer for “Ultimate Answer to the Ultimate Question of Life, The Universe, and Everything“, it calculates for 7.5 million years before reaching the final answer…. 42. Why is this a coincidence? The reason that his death came as such a shock to people is that, just a month ago, he was still at Apple, steering the ship. That just doesn’t happen. You see, people tend to leave work once they get sick. They find out that they have months or even years left, they’re weak… so they step away and make the most of the life they have left. When I first thought about it, I admired how he worked right up until the very end.. or at least, a whole lot closer to the very end than most others would ever do. I quickly corrected myself though, because the very fact that he was there until the very end was indication enough that to Steve, it wasn’t work. We already knew that though, in that he always professed to love what he did and told others to do what they love. And he proved it all the time. Some would say that he was a natural at giving his presentations and a marketing genius… I think he just genuinely loved his work. He was proud. That sort of enthusiasm and excitement can’t be faked. If all of that isn’t proof enough that he loved what he did… 42 will forever be proof enough for me. He was there because he really was making the most of the life that he had left. In the short time since his death (less than 18 hours ago now from the time of my writing this), there has been a constant stream across all social networks of inspiring thoughts, phrases, paragraphs and even entire speeches of his and it’s truly great to see. But all of these great things he said, he didn’t just say them, he didn’t just do some of the things he said… as many of us will try to do, he was those things. He lived it. “Stay hungry, stay foolish” is how he finished his speech at Stanford in 2005. Inspiring words, great thought… but how many of us will live that way from here on out? There are a LOT of very wise and inspiring quotes of his that I could list out here, the fact is… none of them will do you any good unless you live them. Don’t just agree with him, don’t just believe the words he says… live them. Why did Steve Jobs identify with the people in that commercial so well? Why did he deserve to be included with that list of people? Because he lived it. He didn’t just say the words. He didn’t just believe it. He lived it. I see a lot of people writing about how his products have impacted our lives, how his thinking has impacted our lives… what I truly love reading are the posts from Silicon Valley from people who became great people in their own right, because of how Steve Jobs impacted their lives far more than a new iPhone ever could. I don’t need his products to feel his impact. And that’s the beauty of what he was able to accomplish and the true testament to who he was. I want to live my life as he lived his… doing what I love. I want to do what I enjoy doing until my 42 comes. More so than that, I want the same for my children. You see, Autism or not, I want my children to find what makes them happy and then to do it. But as a parent of a child with Autism, it’s even more paramount as one of the defining characteristics of Autism is that autistics can excel quite profoundly so long as they’re able to do what it is that they love. Trying to force someone to conform, in other words, to put a square peg into a round hole, simply does not work. Not with Autism, not without Autism. His products changed the world. His innovations improved our lives. His lessons inspire us to carry that forward. The man did not die.. he became legend. WOW!!! This is amazing. Brought tears to my eyes. 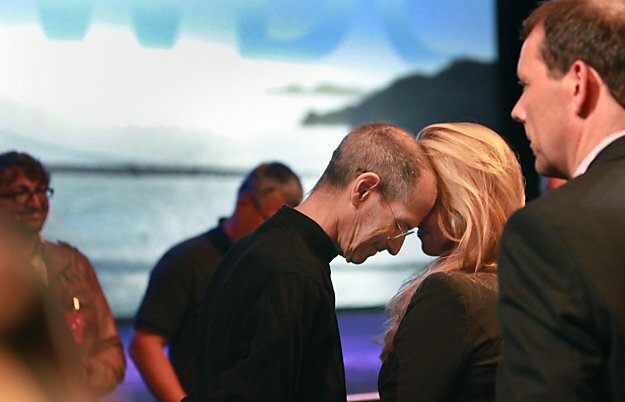 May we all learn to live our lives the way Steve Jobs did. Yes, the Internet has been filled with many stories and postings, but this one says so much. A wonderful read.